Seven Days Blogs: Freyne Land: Bad-Hair-Day Approaching? On the left, a Vermont legend - Art Gibb. Art served in the Vermont House and Senate in the 1960s, 1970s and 1980s, a Republican who cared deeply about Vermont's environmental beauty and integrity and is one of the main reasons Vermont's roadways are not littered with billboard advertising like the other 49 states. He's also a key reason for Vermont's Act 250, the landmark environmental law that's held back commercial, anything-for-a-buck, development. Art Gibb was 97 when he passed away in 2005. More here. On the right - the backside, or rather the ponytail of the Chairman of the House Agriculture Committee, David Zuckerman (P-Burlington). We think it's the longest under the Golden Dome - male or female - not that size matters. Wavy Davy's Ponytail made the blog because it isn't going to be around much longer. Tuesday afternoon it's going bye-bye. In fact, said Zuckerman, enough $$$ pledges come in and he's SHAVING IT ALL OFF! Some of you may remember that a few years ago I cut some of my hair as a fundraiser for kids with hair loss diseases (locks-of-love). Your generosity helped provide over $3,500 to go along with my wife's and my ponytail “locks”. 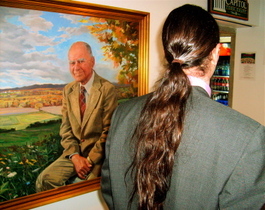 Zuckerman says his longest measured hair strand was 35-inches long. Does this indicate Zuck's getting ready for a statewide race? How many Vermonters have hair as vibrant and full as Mr. Zuckerman's hair? And in the dead of winter, too! His hair is a testament to the value of a healthy lifestyle. While some have suggested an ulterior motive (such as running for higher office), this act of donating his hair to help others and collecting pledges to be distributed to youth services organizations reveals his kindness, thoughtfulness and generosity. We could all take a page from this book. I'd love to send David a donation -- anyone know how or where? Last time he grew a power pony in no time flat ... all that family love, digging in the dirt, contra dancing, and good work on our behalf under the golden dome pays off. Wish we had a dozen more just like him.